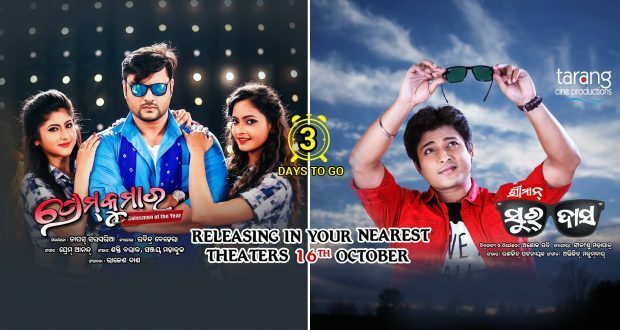 Bhubaneswar: 14/10/18:There will be petition between between two Odia films scheduled to hit theaters during Durga Puja this year. Both the films ‘Sriman Surdas’ and ‘Prem Kumar’ are produced under the banner of Tarang Cine Productions. One film old Shivani Sangeeta is excited about her second release ‘Prem Kumar’ opposite superstar Anubhav Mohanty. Directed by Tapas Sargharia, the film’s music has been scored by Prem Anand. hivani, whose debut film, ‘Sister Sridevi’ opposite Babushan was a hit in 2017. Babushan and Bhoomika’s pairing in ‘Sriman Surdas’ promises to give a different taste to the audience. The film has been directed by Ashok Pati and the music is by Abhijit MajumdarBuddhaditya Mohanty will also be seen in a different character after a gap of two years.